Fall Creek winds through Oconee County and empties into the Chattooga River. 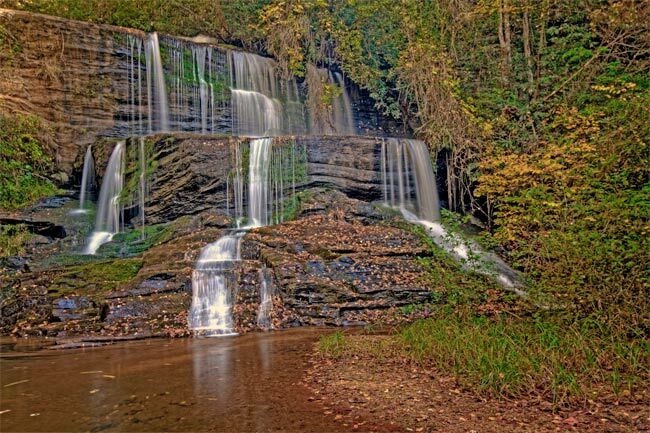 A popular place for hikers, it has three waterfalls over a mile-long stretch, which range from 30 to 50 feet high. The second level of falls is pictured below. A hiking trail along the creek starts at Forest Service Road 722, which is off the Chattooga Ridge Road. For those who only have time for a quick hike, the waterfall pictured here is the first one along the trail and is easy to reach. 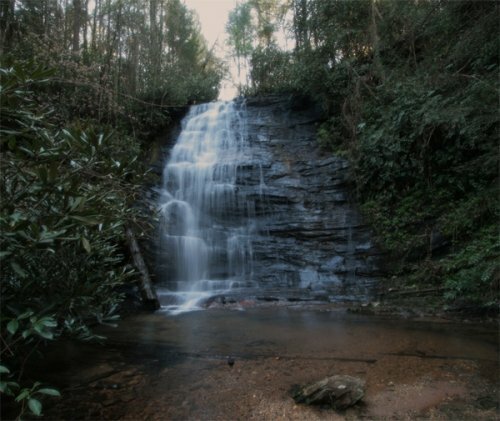 The upper waterfall (shown below) and is 35 feet tall. For more adventurous explorers, the trail continues two miles downstream where you can see the other falls. It becomes more difficult the further you hike since it is not well marked and the thickets are overgrown.